You don’t have to be a top-ranked triathlete to reap the benefits of cross-training. Above: Paula Findlay in London winning her first elite World Championship Series race on the same course that will host the 2012 Olympic event. In less than a year, the Edmonton native had risen 50 spots up the world ranking to No. 3, after a stunning series of international victories. Findlay first found herself in the spotlight last July, when she won her first elite World Championship Series race in London, surprising the sports world. A year later, as predicted by sports journalists and fans, she had a chance to secure a place on the Canadian Olympic team. Now, her underdog days are gone, and if the 22-year-old lands a medal at the 2012 Olympic Games in London, it’s unlikely to surprise anyone. Growing up in Edmonton, Findlay was always an active child. She did ballet, jazz and tap dancing until the age of 15. She began competitive swimming when she was just 11 years old. While in St. Francis Xavier High School, she competed in track and field, but it wasn’t until five years ago that Findlay tried triathlon. It was love at first race. “It’s just a really dynamic and diverse sport, in training and in racing,” she says. Naturally, every triathlete excels at one sport more than the others, and Findlay’s strength is running. “I’ve had more success in running even though I’ve swam more in my life,” she says. That said, when Findlay came home for the Edmonton World Cup Triathlon this July, a hip injury prevented her from competing. She made a brief attempt at a comeback, but had to withdraw from a September race in China and will miss the rest of the season. She wants to be at her best for the 2012 Olympics. 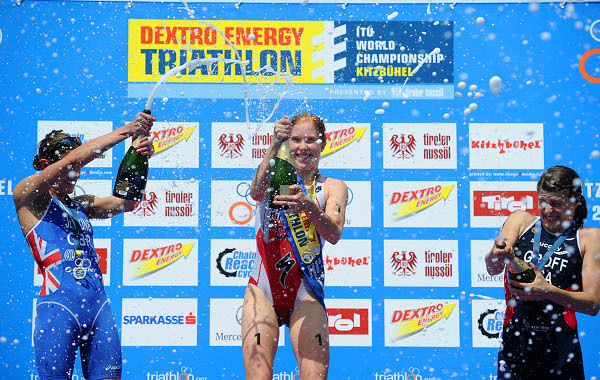 Above: Paula Findlay at the Dextro Energy Triathlon ITU World Championship Series in Kitzbhel, Austria in June, her fifth win in six races. Her local fans may not get a chance to see the young athlete in action for quite some time. That’s because Findlay is now based in Victoria, B.C., the home base of the Canadian Triathlon Team. But before relocating to the west coast, Findlay could often be spotted at the Kinsmen swimming laps, running and cycling at Hawrelak Park during the warmer months, or jogging around the track at the Butterdome. Whether or not you’ve got competitive blood, following in Findlay’s footsteps (and tread marks) can drastically improve your level of fitness. A Swedish word, fartlek, means “speed play.” Start with a 15-minute easy jog and gradually increase your pace for the next 15 minutes. Now that you have warmed up, repeat this sequence three or four times – three minutes of running as fast as you can, and two minutes running at a moderate pace. Spend the last 10 minutes cooling down with a gentle jog. Find an 8-to 10-minute bike loop and measure out a one-km run (use mapmyrun.com to plan your route). Cycle at the same intensity you would in a race, then hop off your bike, transition to your running shoes and run hard for 1 km. Repeat this 2 to 4 times. This is an important workout for triathletes of all levels who need to learn how to rapidly transition between sports. effort, and then 100 metres as hard as you can. After each rep, take 20 to 30 seconds to catch your breath.